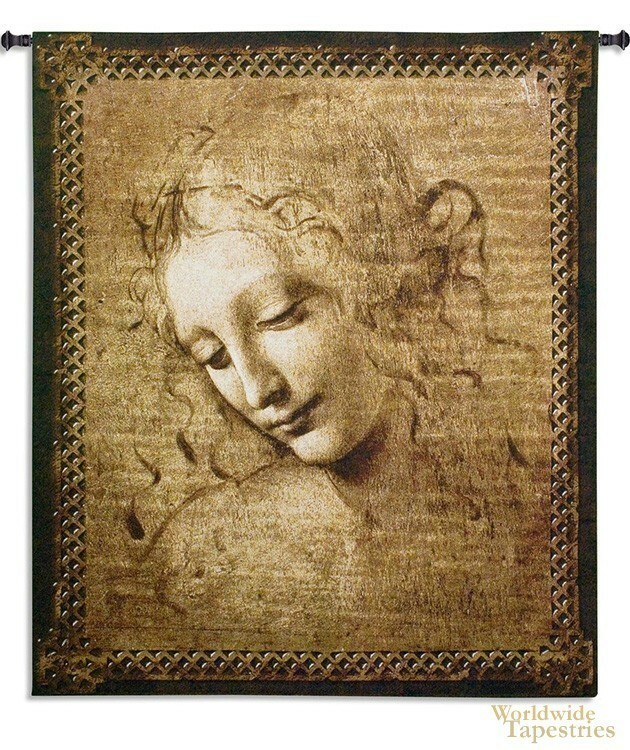 This tapestry shows an illustration of a female face by da Vinci. In the period of the Renaissance, da Vinci's illustrations bridge the borders of science and art. His studies of the human form was characteristic of his intense interests in the reality of the human figure when depicted by art, yet with a feel of the emerging art movement which bought a slight idealism and romanticism in the way the subjects were composed. Such was the combination which elevated art in this era to new heights and sensuousness which is only possible with the appropriate portrayal of scientific accuracy yet with the influence of the artist as well. This tapestry here is composed of rich rustic sepia tones and shows a relaxed yet hinting at thoughts behind the expression facial expression that is characteristic of many of da VInci's works. This tapestry is backed with a lining and has a tunnel for easy hanging. Note: tapestry rods and tassels, where pictured, are not included in the price.